Investors are often ambushed in the perceived safety of their comfort zones. Growth and fulfillment don’t show up on the set of Ground Hog’s Day. Welcome to the world of difficult-easy — where stuff that feels hard doesn’t get you anywhere (for example, getting up early and working late at a low paying dead end job). Plateauing in a worn-out rut (e.g., going to the gym three days a week and repeating the same 30-minute exertion-free walk on the treadmill). We all need to spend more time on a road less traveled. Difficult-difficult is something different; this is the stuff most avoid because it’s hard. Think of parachuting out of a plane into an unknown land. Vast riches may await you. But, you will never know because you never jump. Things most people resist and avoid. Many investors choose the wrong door and go down the difficult-easy path when investing. It’s difficult to contribute 15% or more to a retirement plan. It’s easy to ignore fees. It’s easy not to ask tough questions. This is the equivalent of busy work; showing up on time and looking productive to impress the boss. Your retirement needle is not moving at anything close to an acceptable pace. Conflicts of interests and high fees are the financial equivalent of digging a hole to nowhere. 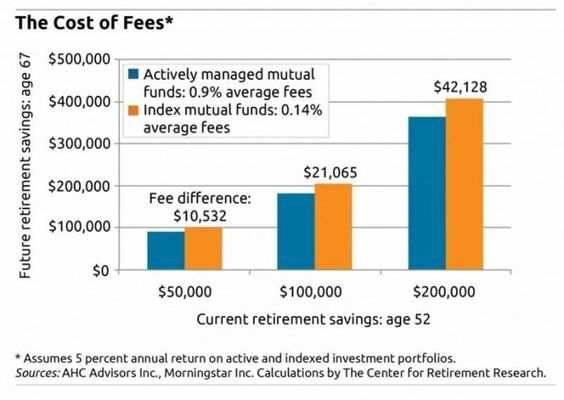 It’s not enough to pick a so-called “advisor” and start a savings program. Step out of your comfort zone and embrace hardship. It’s difficult to save money when life gets in the way. It’s difficult to fire a conflicted financial advisor when he has been your well-paid friend for 15 years. It’s difficult to ignore your greed when Bitcoin is soaring past $18,000. It’s difficult to ignore your fear and stay in the market when it falls 50% or more. It’s difficult to focus on a financial plan rather than hot stocks or sectors. It’s difficult to hold a diversified portfolio knowing a portion of your investments will lose money every year. It’s difficult to understand that the long-term is comprised of numerous short-term scary events. It’s difficult to stash your FOMO in a closet and throw away the key. It’s difficult to embrace uncertainty and get comfortable being uncomfortable. I’ve no control over returns. I can control savings. I’ve no control over outcome. I can control process. I’ve no control over markets. I can control my own behaviour. Being a difficult-difficult investor is not easy (if it was, everyone would be a millionaire). Saving for a retirement is not a game. Looking the part is not enough. Don’t be a retirement poseur. If at times investing doesn’t scare the crap out of you, require sacrifice, and cause tremendous frustration – you are doing something wrong. The effort is meaningless without purpose. A meaningful retirement doesn’t come easy.